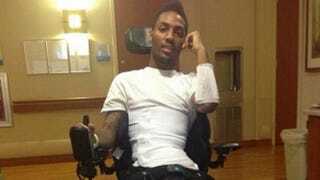 Nearly two years after Pittsburgh police shot Leon Ford Jr. five times during a traffic stop, leaving him paralyzed, prosecutors announced Friday that Ford would not face a second trial on charges stemming from the incident, BET reports. The 2012 shooting generated one of the earliest protests against police use of force in black communities. To promote healing between police and the community, Stephen A. Zappala Jr., the Allegheny County district attorney, said that charges of reckless endangerment, resisting arrest and escape have been dropped, BET says. During a trial in September, a jury deadlocked on the charges of endangerment, resisting and escape but cleared Ford of two counts of aggravated assault against police officers, according to the news site. Zappala said in a statement that concerns in the community about police training, tactics and relations played a role in the decision to clear Ford. He also said the injuries Ford suffered would be a deterrence of any future conduct of this type, the report says. “Given the efforts of Chief [Cameron] McLay to improve police and community relations, it is my hope that not proceeding to a second trial will assist both the Chief and our community in this regard,” Zappala said in the statement, BET says. The shooting occurred Nov. 11, 2012, when three Pittsburgh officers pulled Ford over for a traffic stop. Although he produced several pieces of identification, they thought he was another man, also named Ford, who was wanted on an arrest warrant, according to the Pittsburgh Post-Gazette. The officers testified at trial that they asked Ford to get out of his car after allegedly spotting a bulge in his sweatpants, the report says. When Ford refused to cooperate, Officer David Derbish climbed inside the car, the report says. The car then reportedly slipped into gear, and Derbish fired five shots, leaving Ford paralyzed, the report says. Derbish has been placed on desk duty while the U.S. Department of Justice investigates the incident, McLay said in December, the Post-Gazette writes. In September 2013, Ford filed a federal lawsuit against the city and officers involved in the traffic stop. Read more at BET and the Pittsburgh Post-Gazette.